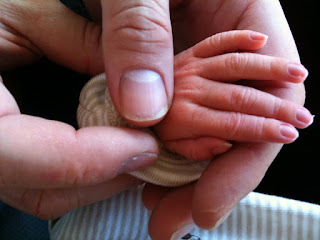 The midwife came today for Kien's weigh in - 3.00kg! That is so fantastic since babies are expected to be at their birth weight by 2 weeks. I guess I shouldn't be surprised since he really does like to eat constantly - pretty much takes after his mother really in that department. We had to cut his fingernails today because they were so long and he was scratching himself. Mittens stay on him for all of a minute. We've tried socks, they last for 2 minutes.